National Map is a website that provides map-based access to spatial data from government agencies. National Map provides easy access to government spatial data. It helps government bodies make their data open and public. It also provides an easier way to compare multiple datasets by linking them through information about their location. For example, it can show different types of service that are close to each other. Government bodies, businesses and members of the public can all use this website. 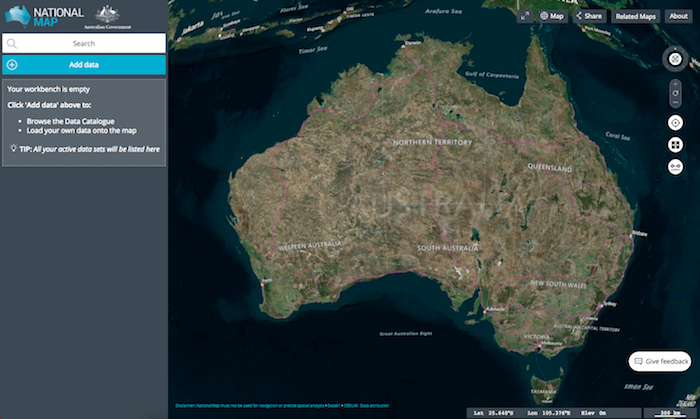 Go to nationalmap.gov.au to view government spatial data. Government organisations that want to supply data should go to the help section of the National Map website. Spatial datasets placed on data.gov.au will automatically be included on the National Map website. However, they need to use supported data formats and protocols such as Web Map Service.